Richard I, surnamed Cœur de Lion, was born 1157, and ascended the throne on the death of his father, Henry II, Sept. 3rd, l189. He had previously taken the cross, and now resolved to fulfil his vow in the fields of Palestine for which object he raised money by the sale of the crown property and offices, and a great number of English barons joined in the enterprise. In 1190 Richard joined the Crusade with Philip Augustus of France; and 100,000 of their bravest subjects met together on the plains of Vezelai. The two royal crusaders proceeded by separate routes to Sicily. There they quarrelled, but were reconciled by means of a large money payment by Richard. After some months’ stay in Sicily, they again set forward; Richard on the way making himself master of Cyprus, and giving it to Guy of Lusignan. In Cyprus Richard married the Princess Berengaria of Navarre. Early in June he arrived at Acre, which was then besieged by the crusaders. It was taken soon after; but mutual jealousies arose among the Christian princes, and Philip returned to Europe, leaving behind him 10,000 of his men. Richard remained in the East where he displayed the most heroic valour against Saladin, whom he signally defeated near Cæsarea. Having made a truce he embarked in a vessel which was shipwrecked on the coast of Italy. He then, in the disguise of a pilgrim, travelled through part of Germany but being discovered by Leopold, Duke of Austria, he was made prisoner and sent to the Emperor Henry VI., who kept him confined in a castle some time. He was as at length ransomed by his subjects for 150,000 marks, and landed at Sandwich in 1194 after which he was again crowned. Philip having, contrary to treaty, seized on part of Normandy, Richard invaded France with a large army, but a truce was concluded in 1196. The war was, however, soon renewed and Richard, in besieging the castle of Chalus in March, 1199, was wounded by a shot from the cross bow of one Bertrand de Gourdon who being asked what induced him to attempt the kings life, replied, ‘You killed my father and my brother with your own hand, and designed to put me to an ignominious death.’ Richard then ordered Gourdon to be set at liberty and allowed a sum of money; but the savage Marcadée, who commanded the Brabançons, caused him to be flayed alive. Richard died of his wound on the 6th of April, 1199, in the 42nd year of his age, and the 10th of his reign, leaving no issue. His queen, Berengaria survived him till about 1230. His character was strongly marked, presenting much to admire and much to condemn He was the bravest among the brave; frank, liberal, and often generous; at the same time he was haughty, violent, unjust, and sanguinary; uniting, as Gibbon observes, ‘the ferocity of a gladiator to the cruelty of a tyrant.’ His talents were considerable, both in the cabinet and in the field; neither was he deficient in the art of poetry, and some of his compositions are preserved among those of the Troubadours. 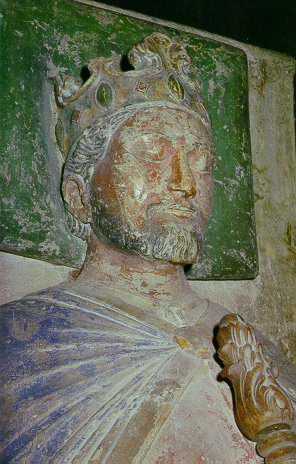 Richard I. bequeathed his heart to Rouen: it was placed in a silver vase, which was melted in 1260, to aid in the ransom of St. Louis from the Saracens. The relic itself in a case of lead, is now in the museum of Rouen. The tomb-statue of Richard was discovered in the Cathedral of Rouen, by Deville, in 1838; and soon after that of his brother Henry. Two volumes have already appeared of ‘Chronicles and Memorials of the Reign of Richard I.,’ edited by W. Stubbs, M.A., under the authority of the Lords Commissioners of her Majesty’s Treasury.